The Purdue Pi Kappa Phi chapter showed how it sets the standard for servant leadership as it completed its Abilities Week during homecoming week by raising $5,000 for people with disabilities. The week started with two days of Pi a Pi Kapp on Monday and Tuesday, Sept. 17-18, which raised more than $600. Chapter members lined up and took a face full of “pie” made up of various condiments such as ketchup, mustard, or mayonnaise added with other options including whipped cream, chocolate or caramel syrup and even ranch dressing. Passersby or pre-planned “attackers” threw, smeared or smashed the pie into a face for $2 for one ingredient and another for $1 each. At 5 p.m., Wednesday, Sept. 19, chapter members kicked off the Eighth Annual David Feltner 72-Hour Memorial Bike a Thon. During the tree-day span, the chapter amassed more 330 man hours on two or three stationary bicycles set near the belltower in the middle of the Purdue campus. The event had seven sororities competing for distance with five riders over 25 minutes. It also included a rider by Brandon Cutler, associate dean of students for fraternity, sorority and cooperative life at Purdue. Undergraduate riders committed to a $10 per hour donation and alumni were to give at least $25. The event is held in memory of Feltner, who as an undergraduate in 2011, died of a rare form of cancer. As a student, Feltner was very involved in the chapter’s Ability Experience programming and was in the first group to assist special needs classes at Lafayette Jefferson High School. Phi Sigma Rho won the distance competition, traveling 8.02 miles in 25 minutes. Other participants included: Alpha Xi Delta (two teams), Sigma Kappa, Delta Delta Delta (two teams), Phi Mu and Zeta Tau Alpha. Mail contributions can be made payable to: The Ability Experience; c/o Pi Kappa Phi; PO Box 2700; West Lafayette, IN 47996-2700. For the calendar year, the chapter has raised $16,170 for the philanthropic effort to assist people with disabilities. Because David Feltner’s parents moved to Florida, they were unable to ride the last five minutes of the bike a thon as they have done in the previous seven. However, this year three of Feltner’s pledge brothers rode at the end. TJ Tomasik, Mike Lolkus and Andy Scheil were the riders. Two of them addressed chapter members and alumni who gathered in the chapter house’s Great Hall to celebrate the bike a thon’s success. Tomasik recalled the last time Feltner announced at chapter that his cancer had returned. He asked that his fraternity brothers shave his head rather than him losing it to chemo. He also talked about Feltner facing the fear of his mortality. He said the fraternity member said they would be with David whatever the outcome. Lolkus talked about Feltner’s bravery, facing his rare type of cancer that few people survive beyond the age of 13. He thanked the chapter members for continuing the fund-raising efforts on Feltner’s behalf, benefitting something he believed in – The Ability Experience. “It’s extremely moving to see that you guys embrace this ride through this weekend,” Lolkus told the crowd gathered back at the fraternity house. 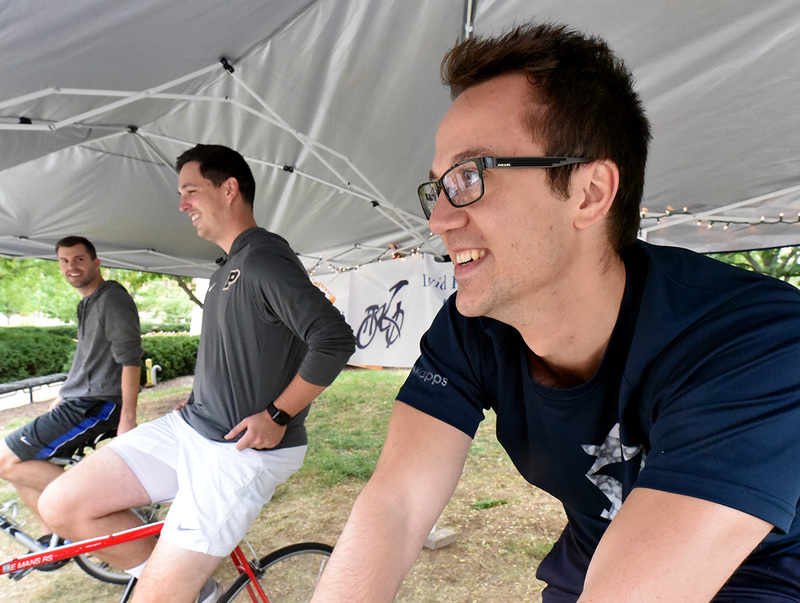 The bike a thon included simultaneous Facebook Live broadcasts – one including a virtual ride along from Charlotte with Ability Experience CEO Basil Lyberg with chapter alumnus and national staff member Brent Grunig, and a second from the cycling site on campus. Lyberg and Grunig talked about the Purdue chapter’s activities that engage more than 2,000 people each year on campus as well as in the community. They also talked about national programs such as Gear Up Florida and Journey of Hope. The feed from Charlotte has been seen more than 2,200 times on Facebook. The chapter regularly updated its webpage during Abilities Week. During that time 176 different users viewed more than 600 pages during 225 sessions. However, the footprint on Facebook was very significant. The chapter’s Facebook page was updated several times a day from Pie a Pi Kapp through the bike a thon. The reach topped 6,000 as the page was accessed more than 3,500 times. Furthermore, the chapter’s online donations on the Ability Experience website saw more than $1,000 donations from chapter alumni and rider supporters.